The Jethro Tull remasters continue with A Passion Play from 1973. Steven Wilson returns to sit behind the sound board and make his magic happen yet again. This special book edition is subtitled An Extended Performance. Ian Anderson has all the faith and trust in the world for Wilson and with good reason; he has proven to be asset in restoring some of the early Jethro Tull back catalog already. This beautifully packaged 2CD/2DVD case-bound book includes 80 pages with vintage photos. The expanded edition includes the original album, and earlier Château d'Hérouville Sessions, both mixed to amazing 5.1 surround sound and new stereo mixes by Mr. Wilson. 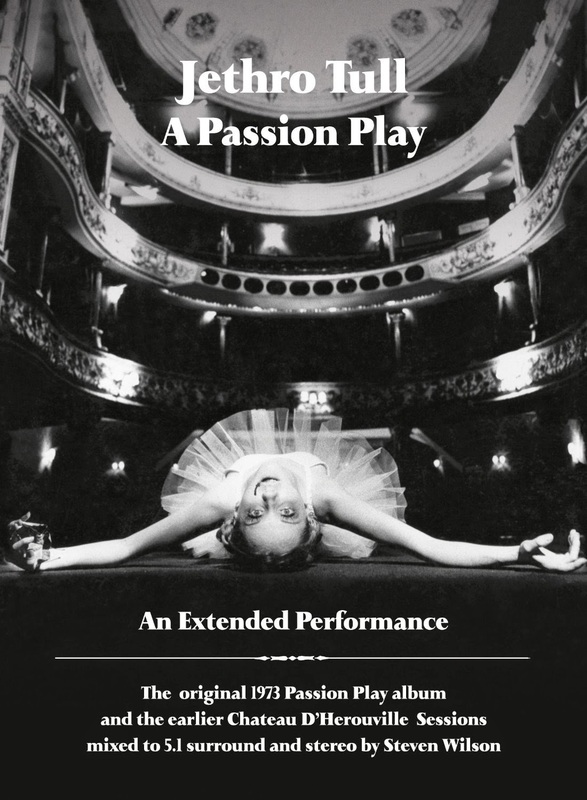 As stated on the band’s website: Like its predecessor, Thick as a Brick, A Passion Play is a concept album with a single song (which was split into two parts on the original vinyl LP release). The theme of the concept is the spiritual journey of one man in the afterlife. That pretty much sums up the album’s meaning on a conceptual level however the music is another matter entirely. There was not a good reaction from the press at the time of this album’s release, but as usual they were dead wrong and this went on to be an unheralded prog rock classic and it still stands up quite well today. This is very complex music set to an interesting story (of course). And what would one expect from Ian and the boys anyway? To hear it all again now remastered in 5.1 surround sound is indeed a blessing as it brings out a lot of the original intent more clearly and concisely than the original recording. The presentation itself is as grand as the recording and as such deserves all of this special treatment. Some great information becomes available throughout the 80 pages of text included with this book version. You get an inside look at the recording process and some of the challenges involved where they did the initial recording session. I won’t go into detail to ruin the experience for anyone that has not purchased this yet, but rest assured it is all very entertaining. A few tracks in and the realization that Passion Play is a brilliant slice of prog rock hits home with more impact than ever. “Critique Oblique” is a classic prog rock workout reminiscent of its predecessor TAAB. “The Story Of The Hare Who Lost His Spectacles” I am sure was fun to record but it still sounds very strange to me (and the short film provided is even more so but alas it was theater). It is part of the story so it couldn’t be a track that never made it to the album then reemerge as bonus track. “The Foot of Our Stairs” is a proper return to form, now with the addition of 2 extra verses found on the end of the multi-track reel. Things continue on from there with so many transitions it would make any worthy musician or intent listener’s head spin. And to that I say well done lads! “Magus Perde” is powerful and engaging as it gets. It has some fantastic keyboard passages and the guitar sound is different than usual while standing out very well. Also found on the first DVD and your choice of remastered tracks is the intro and outro film used during the tour. I can imagine many audience members freaking out at the time watching what the ballerina does. Her starting position was laying on her back looking at you with her head upside down and moving her limbs every so slightly for several minutes until finally getting into the position to dance. Then eventually she finds a mirror and jumps into it only to come crashing back through the other side to end the show. I cannot imagine the wow effect it had on the many completely stoned audiences back then. The Chateau d’Herouville Sessions fills the second discs (CD & DVD) and it is a new Steven Wilson stereo mix that stands out. The DVD with its different surround sound versions includes scrolling pictures of the band as the music plays. A few tracks that never made it on Passion Play but on to War Child are featured in their native form. “Skating Away” and “Solitaire” provide a window into what War Child would become. All of this music was definitely worth revisiting and I think fans will appreciate hearing it. The new discovery factor and then the realizations of new sounds 40 years on comes rushing at you proving it is still a big part of what these sets have to offer. After listening to this great music of the past it is reaffirmed that Jethro Tull was a unique band and Ian Anderson’s vocals and all around talent was the core driving force. I plan to continue to enjoy all of this older music coming back to life and the new music on offer from the incredible Mr. Anderson and company.